By I. Spiewak & Sons, North Bergen, New Jersey. Marked as a size 38 and has a physical external pit to pit (x2) measurement of about 39 - 40". The classic A-2 flying jacket. Seal brown leather with matching cotton lining. The leather is generally very good to excellent with no rips or repairs. It seems to be strong and remains good and supple. There is some wear and abrasion on both sleeves with surface cracking and relatively minor damage at the shoulders/upper arm areas. Complete with all the usual A-2 features including the collar snaps and hook, leather hanger, underarm vents, label and original 'Talon' zip. This jacket retains its original chocolate brown wool knitted cuffs, both in very good condition. The original knitted waistband has a few small snags/holes but nothing that detracts. The lining is generally sound but a bit soiled and there is damage adjacent to the collar/lining seams (see photographs). There is also restitching evident at the edges of the lining. The jacket has an original leather name tag 'H.M Kennard Jr.'. This is coming adrift but could easily be restitched should the buyer want to. It also has original leather rank bars sewn on the epaulettes and there are tell-tale holes where a shoulder patch was once stitched. 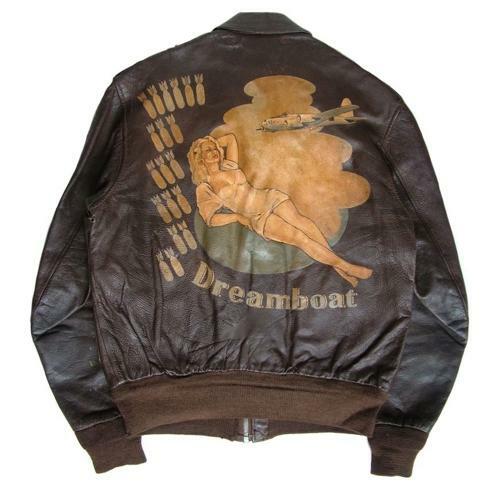 The back of the jacket is painted and features a scantilly clad reclining blonde, B-17 bomber, bombs, and the name 'Dreamboat'. This artwork would appear to have been added after the war but research suggests the jacket belonged to Harold Mortimer kennard Jr., service number 20272148. A resident of Glen Ridge, New Jersey, he was born 21/11/18 and enlisted in 1941. Overall this is a very good solid jacket. Additional photographs available on request. Stock code J22385.